This near-infrared image shows the star cluster called Terzan 5 within the Milky Way's bulge. A clusterof ancient stars is likely the relic of a dwarf galaxy that merged with theMilky Way during its early days, scientists now find. CalledTerzan 5, the globular star cluster lies within the Milky Way's central bulgeof stars that protrudes up and down from the galaxy's flattened disk. Aglobular cluster can host a collection of 10,000 to 1 million-plus stars boundtogether by gravity. The traditional view of the 150 or so clusters in ourgalaxy has been that the stars of each one, typically ancient in cosmic terms,were born at about the same time from one cloud of gas and dust. Newobservations with the European Southern Observatory's Very Large Telescope showthat's not the case for Terzan 5, whose stars break out into two populationswith different ages and chemical compositions, which can indicate where thestar's material originated. Thefindings will be detailed in the Nov. 26 issue of the journal Nature. In anotherpaper published this week in Nature, a team of scientists led by Jae-Woo Lee ofSejong University in Korea finds various other globular clusters contain twostar populations and could be relics of more massive dwarf galaxies. Both newfindings will help astronomers piece together our galaxy's past, including howit formed some 13.7 billionyears ago and then evolved at least in part by gobbling up other galaxies. 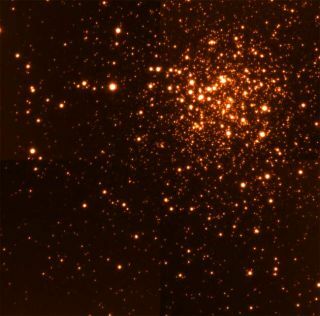 "Thehistory of the Milky Way is encoded in its oldest fragments, globular clustersand other systems of stars that have witnessed the entire evolution of ourgalaxy," said University of Bologna researcher Francesco Ferraro, who ledthe team studying Terzan 5. Specifically,when looking at data collected on Terzan 5, Ferraro's team found one group ofstars dating back 12 billion years, while the youngest stars were born some 6billion years ago. The two populations have different abundances of iron, withthe younger group having three times more of the heavy element. Iron andother heavy elements are mostly produced in supernovaeexplosions, the guts of which form seeds for new star formation. Eachgeneration of stars, theory holds, have more heavy elements than theirpredecessors. "Thesupernovae explosions are so violent that they tend to eject the gas outsidethe entire stellar system," Ferraro told SPACE.com. "Then in order toretain the gas the stellar system must be very massive." Ferraro added atypical globular cluster doesn't have enough mass, or gravity, to retain thesupernova's ejected material. As such,the team says their findings indicate Terzan 5 is not a genuine globularcluster. Here's whatFerraro and colleagues think must have happened: Some 12 billion years ago,Terzan 5's first clump of stars formed, then some exploded. Then, about 6billion years ago, the iron-enriched gas from the explosions helped to generatea second group of stars. Sincesupernovae explosions tend to kick gas out from the clusters in which theyoriginate, the researchers think Terzan 5 must have been much more massive, bya factor of 500 to 1,000, in the past compared with today. The teamalso found the oldest stellar population in Terzan 5 has the same chemicalcomposition as the Milky Way's central bulge. Takentogether, the results provide insights as to how the bulge, though not theentire galaxy, formed. "Hencethe bulge may have formed through the early aggregation of individuallypre-formed and somewhat internally evolved stellar systems," Ferraro said. "Thus suggesting that the inner bulges of spiral galaxies can originateby accretion of small sub-structures."